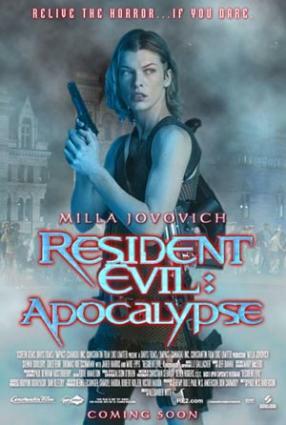 In Resident Evil: Apocalypse, the horror sequel to Resident Evil, we are given an inside look at how the T-virus outbreak affected the residents of Raccoon City, learn how the experiences of the first Resident Evil changed Alice (Milla Jojovich), and we finally get to see the character of Jill Valentine (the heroine of the RE and RE 3: Nemesis video games) in action. Resident Evil ended with Alice escaping from the medical research labs of the Umbrella Corporation and emerging onto the cluttered streets of Raccoon City. Apocalypse picks up here, more or less, and shows us the chaos that ensued in the city following the incident in The Hive. We also get to see the goings-on within the Raccoon City police department and its special S.T.A.R.S. unit. This was particularly exciting to fans of the game series because the character of Jill Valentine (Sienna Guillory) is not only featured, but featured heavily in the story. We see s few other S.T.A.R.S. members familiar to video game players as well, including the dreaded Nemesis from RE 3. The Umbrella Corporation, running damage control, has completely locked down Raccoon City with military precision so that no one can get in or out. Alice, leading a small team of survivors, meets up with Jill who is also guiding survivors through the city, and the two groups team up to fight their way through hordes of zombies and other vile creatures unleashed by the effects of the virus. To complicate matters, the group has been contacted by an Umbrella scientist with a request to save his daughter who is trapped inside the Raccoon City school. It all boils down to an inevitable confrontation between Alice and the monstrous Nemesis, a mutated former companion of Alice's who has been programmed by Umbrella to seek out and destroy any target the corporation opts to designate. The ending, of course, is left open enough to allow for a sequel, Resident Evil: Extinction, listed as currently in pre-production by The Internet Movie Database. Resident Evil: Apocalypse is not a good movie by any stretch of the imagination. In fact, it's pretty bad by most standards. It does, however, succeed where Resident Evil failed; it managed to bring a number of the video game's fans into the fold by bringing more characters and situations familiar to them into the movie. Fans of horror movies, action movies, and scantily clad women (Jojovich spends most of the film in an outfit that appears to have been painted on, and Guillory wears the tiny blue top and black miniskirt familiar to those who played Nemesis) will definitely find some things to enjoy, but there's just not a lot of substance to be found in Resident Evil: Apocalypse.